The demand for online job search has increased and hence there is more online job search websites are coming in existence. It is a very lucrative niche to start an online job board as there is a huge potential of monetization of your job website. Our team has created this theme collection about the best WordPress job board themes which will help you to create an online job board. All of these themes are easy to install and manage. You don’t need to have coding or professional website development expertise to get started with these themes. These themes are equipped with advanced location base searches, category wise searches, job title based searches and profession wise searches. Here are the best job board WordPress themes available currently in the market. 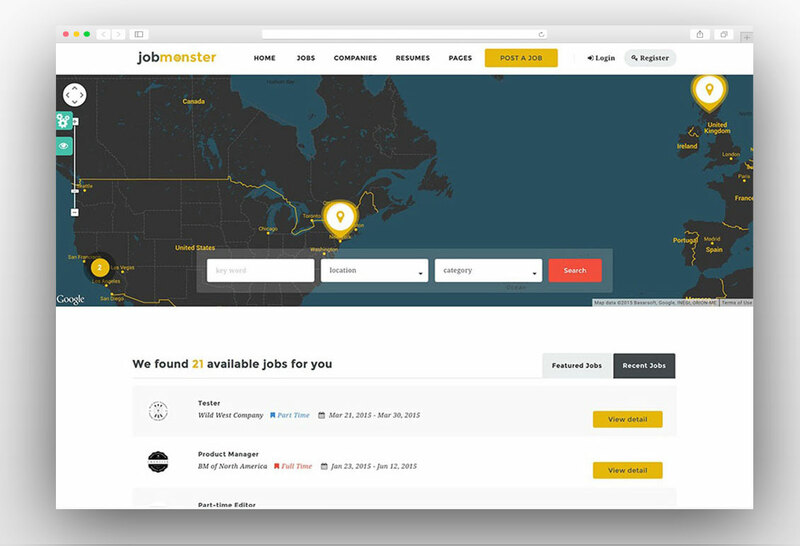 JobMonster is a powerful job board WordPress theme which is fully responsive and retina ready. It’s modern and clean design makes it the best choice for recruitment, HR, and online job portals. The theme satisfies the needs of both job seekers and employers and it has all the features that an online job portal would wish to have on their website. The clean code of the theme will make your website load much faster and perform efficiently. There are five variations for the homepage are available and you can choose the best one which best presents your business. The advance search comes with many filters and the user can funnel the results with respect to job function, area, salary range and much more. You can turn your website into a full-time business as the extensive monetization option is available. You can charge the members of the website for uploading a resume and you can create packages for this purpose. You can limit the features in some packages to get more paid members. The candidates and employers can contact each other through the private message and this is the built in feature of this theme. Some other great features of this theme are job alerts, job bookmarks, social logins and slider revolution. Jobseek provides the complete solution for job boards, recruitment agencies, and HR professionals. 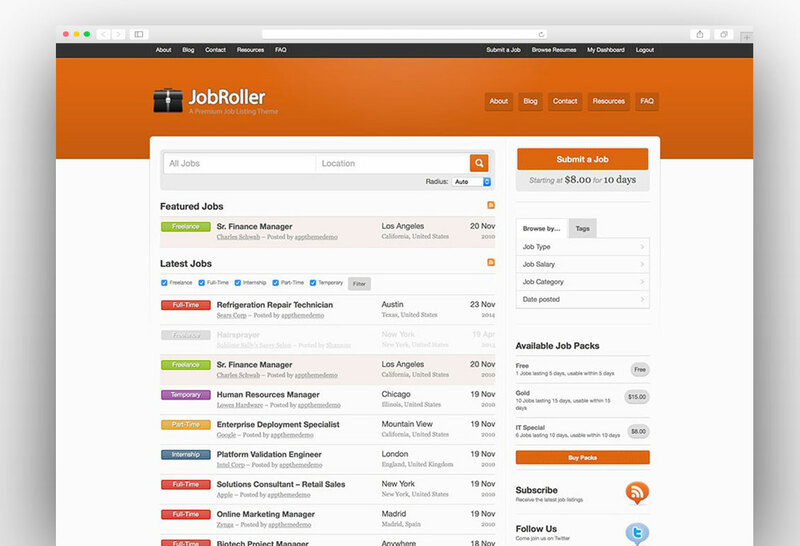 The theme features the filterable job searches making it easier for candidates to find the most suitable job for them. There are many ready-made page layouts included in the theme and you can choose the one which best meets your needs. Users can submit their resumes from the frontend and employers can post a job from the frontend after completing the registration process. The rich admin panel allows you to manage all aspects of the website from the dashboard. You can approve or disapprove the frontend submission from your dashboard. The resume manager allows candidates to manage their resume, update and edit from their dashboard. They can also check their application history from their dashboards. Candidates can create a job alert for a specific area or areas of their professional interests. Application deadlines can be seen in the dashboard so that candidates never miss an ideal job for them. Visual composer page builder has been added to the theme package for the free and you can design the layout for your next website. In addition to the visual composer, the slider revolution premium plugin has also been added to the package for free. 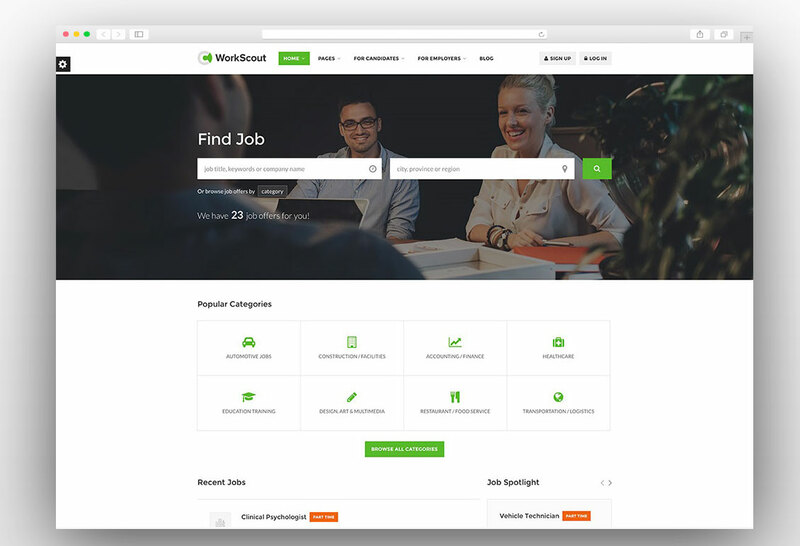 Work scout is the professional, responsive and retina ready WordPress job board theme. The theme has been built from the scratch to extend the WordPress job manager plugin. The filterable job search bar will allow candidates finding desired results and they can filter by job type, salary range, job function, and area. The tag cloud is also available to filter the results by tags. This will give users quick results related to that tag. The job page of the theme has stunning design and it provides a great user experience. All elements are very easy to access and there is a clearly visible call to action for applying for the job. 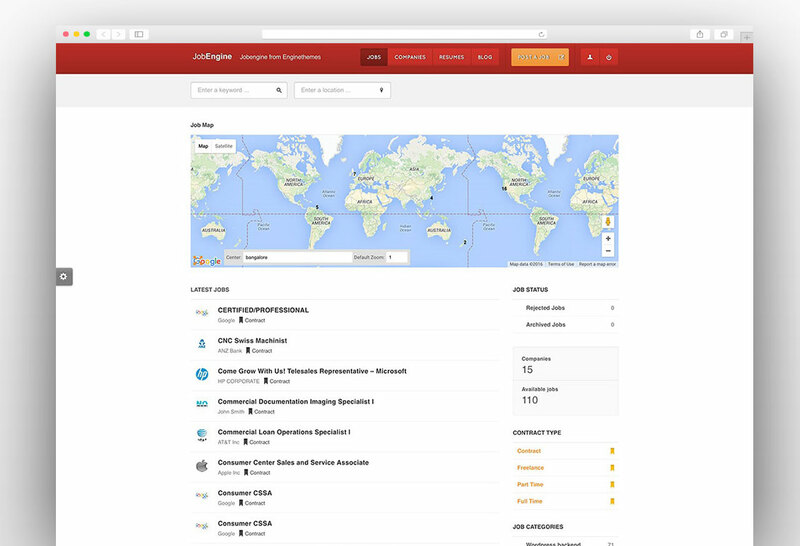 Job listings and resumes can be displayed on an easily configurable map and you can also search with certain radius based on location. The CV page of the theme is also very detailed and user-friendly. It shows the work and experience details of the candidate and the employer can easily contact the candidate via the contact button on the CV page. If a candidate applies for a job then a popup appears which will enable the candidate to apply quickly and choose CV from his profile and give basic information. You can also sell the paid listing through integrated WooCommerce in the theme. 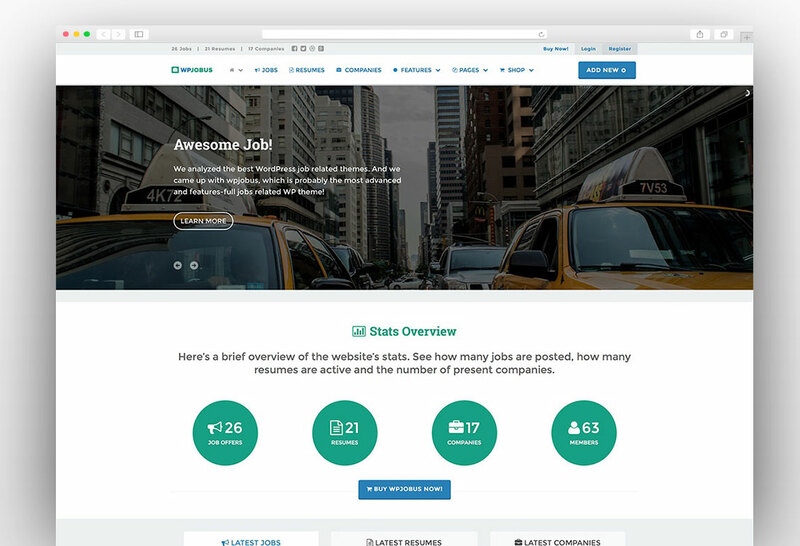 Jobify is one of the most popular job board WordPress themes on the marketplace. You can create a highly professional website using this theme without expert level skills with instant demo content installation. This theme has all the features that you may need to build a powerful job board WordPress website. There are tons of pre-made demos and page templates are available in this theme and you can create a fully customized and unique job website in minutes. It powers the job manager WordPress theme and it is equipped with powerful plugins which combine to give you the best performance. The enhanced search filters make it easier to find the perfect candidate for a job and a great employer for candidates. You can customize the homepage and inner pages of the website with drag and drop page builder. The theme is very light weight and it has clean code which makes it a very fast loading WordPress theme and it gives a great performance. It is fully optimized for SEO and it will give you great results when it comes to the search engine rankings. The theme is a blend of some powerful features and very useful plugins making it a great choice for a job board WordPress website. 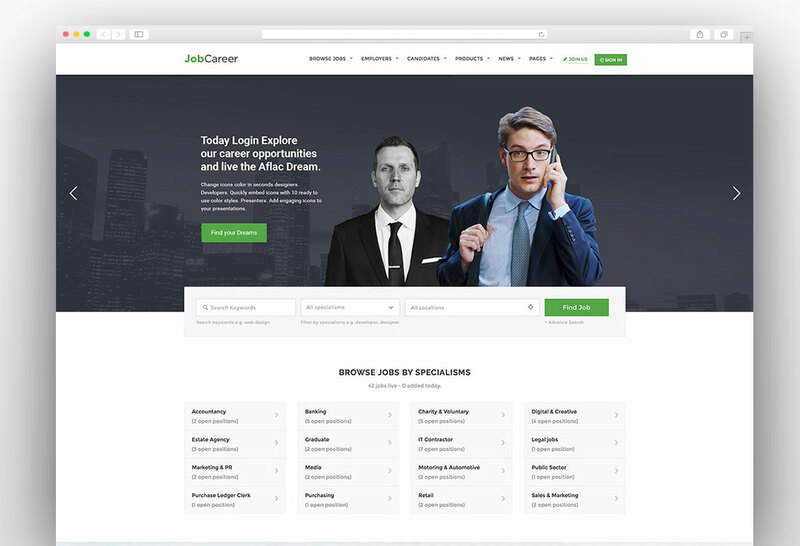 Jobcareer is the fully responsive WordPress job board theme which you can use to create job listing website effortlessly. The theme is completely compatible with the famous themes like Indeed. The theme is fully responsive and retina ready and it will work amazingly across all handheld devices. There are multiple fully responsive homepage layouts providing you a wide range of options to choose from for your job board website. The theme is powered with powerful premium plugins and add-ons which are included for free in this theme. To get started with the theme is very easy as you can install the demo content with a single click. The customization is effortless in this theme and you can complete change a layout with visual drag and drop page builder. The theme has all the features that you may need to build an outstanding job board. Monetization methods like selling paid listings and CV uploading packages have been added to this theme and payments are powered by WooCommerce. 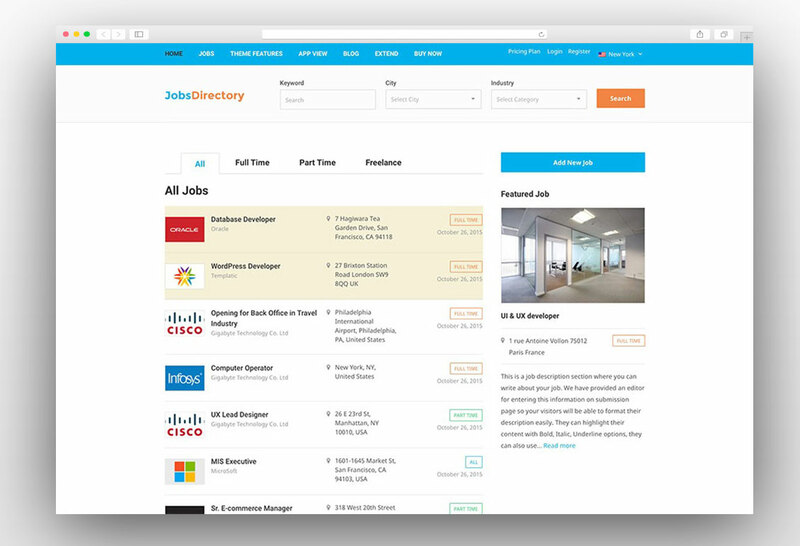 Users can create job alerts and track their job applications from the dashboard. The resume builder is a powerful tool in this theme and it allows users to create a perfect resume to land a dream job. The users can also apply on a job with their LinkedIn profile. JobsDojo is the complete WordPress jobs portal solution which provides the front end submission for both job seekers and employers. You can easily create the pricing plans for the candidates and the employers to monetize the website. The payments can be easily processed via WooCommerce as it is completely compatible with the leading ECommerce plugin. The theme is built on WordPress job manager plugin the leading plugin for the job board websites. The job directory comes with the complex functionalities and advanced filters so that candidates can search relevant jobs for them. Candidates can submit their resumes from the frontend of the website and they can also create a profile including all their work and educational information. Similarly, the employers can offer a job position from the front end. Other than these functions, the theme is fully responsive and retina ready. It looks amazing on all mobile devices. The clean coding makes it load faster which is awesome for search engine rankings. All the colors and fonts are completely customizable and they can be changed from the powerful admin panel of the theme. 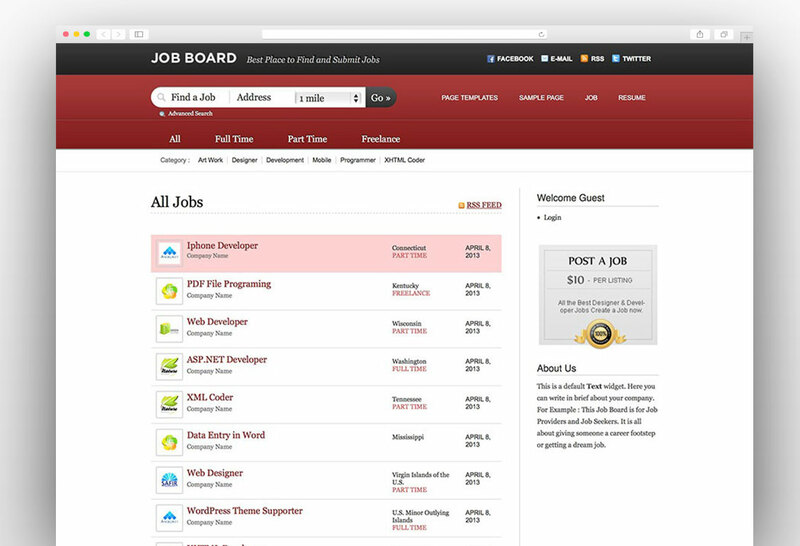 WpJobus is the powerful WordPress job board and resume theme. It is a theme that covers three areas job portal, personal resume, and company profile. All three layouts have a beautiful and clean design which will make your website look so professional. You don’t need to add additional plugins in order to get the full functionality as all the functions required for a Job portal have added in the theme. So you just need to install the theme are your are ready to launch your online job portal. The theme is Stripe ready and payment option is built-in which makes the theme monetization ready and you can monetize your website by publishing feature resumes, jobs and employers. The theme is powered with advanced search field which allows users to filter the results by area, job role, designation, employer and much more. The other features of this theme include the Google maps integration, layer slider, testimonial, front end submission, responsive and retina ready design, font awesome icons, translation ready layout, custom shortcodes and much more. There are also static page templates like how it works, about us, contact us and pricing table page. The modern, beautiful and flat design will definitely make your website stand out of the crowd. Jobs Directory WordPress theme allows creating a job portal effortlessly. There is an easy install within the theme that allows you to install sample data and your website will look like the demo website. In this way, you can get started very quickly. You can use this theme to provide a great opportunity to employers and employment agencies to advertise jobs online. You can charge them for the featured listings and resumes as the theme has been designed with the monetization options to maximize your income from your own job portal. The theme allows you to create your own packages for the paid listings and submissions on the website. Jobs Directory WordPress theme comes with many home page possibilities as you can choose a home page with map, with a slider, with widgets or with all job listings. The best feature of this theme is the app view on mobile phones. You can enable the app view and your website will look like as an app on mobile phones. The theme has an advanced and customizable search bar and you can easily customize various fields of the search bar. Other features include the responsive design, translation ready, premium plugins packed, Google maps, front end submissions, user dashboard, email notifications, powerful admin panel and much more. 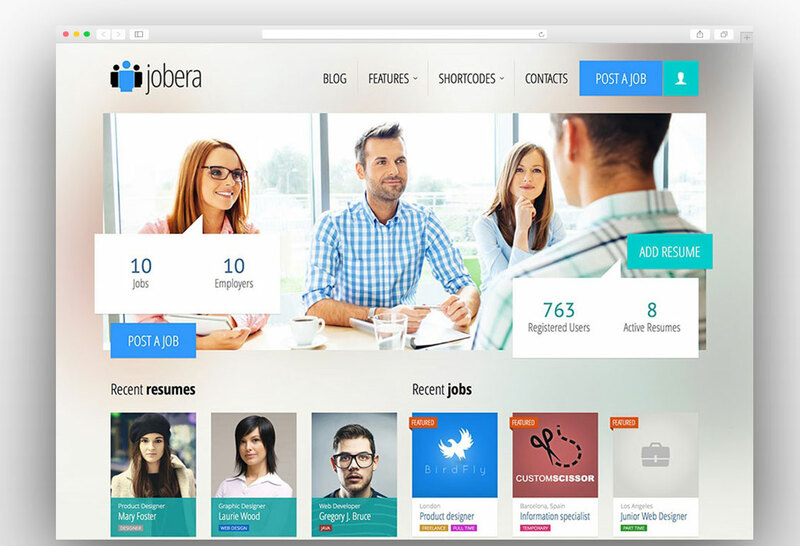 Jobera is a powerful job portal WordPress theme with frontend job and resume submission functionality. The theme is fully responsive and it looks great on all handheld devices. The advanced theme options panel makes it easier to customize and manage the job portal website. There are plenty of customization options are available in the admin dashboard. The custom widgets will allow you create unlimited layouts as there are unlimited widgets areas are available. There are unlimited homepage variations and you can choose that best meets your business objectives and your desired audiences’ profile. There are built in multi color schemes and you can change the color theme of the website by just one click. Jobera is WPML ready and it supports unlimited languages. You can add a slider on your website as premium slider revolution plugin has been added to the theme package. The intuitive drag and drop page builder will allow you to create a new layout of your own choice. The theme is powered with Google fonts to give you wide range of typography options. There is a user-friendly job application form and front end submission system allows employers and job seeker to upload job vacancies and resumes effortlessly respectively. 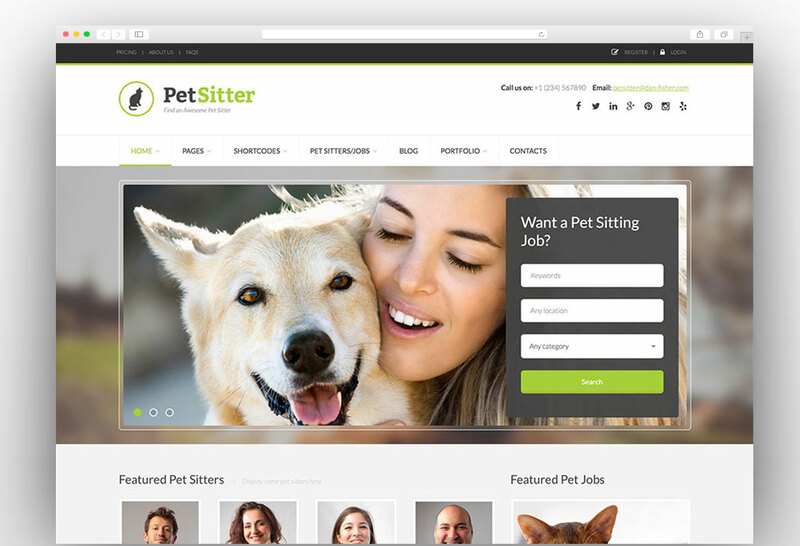 Pet Sitter is fully responsive and retina ready Job Portal WordPress theme. It is the perfect choice for anyone creating a website to list job vacancies related to pets or pet oriented sites. The Redux Theme Options panel is a powerful customization panel that will provide you great opportunity to customize the theme according to your needs. Also, the theme supports other page builders like Visual Composer and you can create unlimited page layouts. The Visual Composer has been added in the theme so it will save you some extra money. There are multiple ready-made homepage layouts and grid layouts to choose from. The theme fully supports the WP Job Manager which will turn your website into a powerful job portal. Users will able to upload resumes through frontend submission form and also the employers will be able to create jobs from the frontend. The theme is translation ready and it can be translated to your language easily. There are unlimited colors and fonts available so that you can enhance the look and feel of the website. The reviewer plugin will allow the user to rate employers and companies which will add the trust element in the users. The theme can be installed with a single click demo importer. JobEngine is a powerful Job Portal WordPress theme which comes with powerful frontend customization tool with a simple user interface which makes the customization process very easy even without much knowledge about the web development. All the content is editable from the frontend and you just need to click on an element and it will show you the customization options available for that particular element. You can easily change the style and appearance of the homepage from the frontend editor. There is advanced search bar which is enabled with Ajax reloading which means when you change some variable then the data on the page changes without reloading the page. The frontend controls are amazing in this theme are you can approve and disapprove a submission without leaving your homepage. There are multiple payment gateways in this theme which makes it a real monetization power house. You can create custom packages for the submissions and featured submissions from the backend of the website. There are unlimited sidebars available which will improve the performance of the website. The theme is full responsive and it looks like an app on the handheld devices which provides a seamless experience for the mobile users. The theme is fully optimized for search engine optimization. 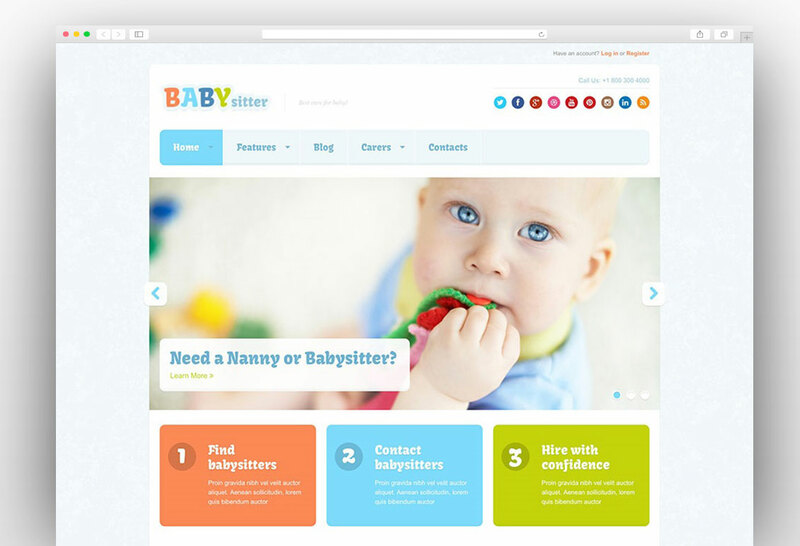 Babysitter is powerful WordPress theme and it is suitable for job listings site, especially for babysitters/nannies and parents, nannies site, a mom’s blog or other baby oriented sites. But that’s not the end as it can be used for creating any job board site. 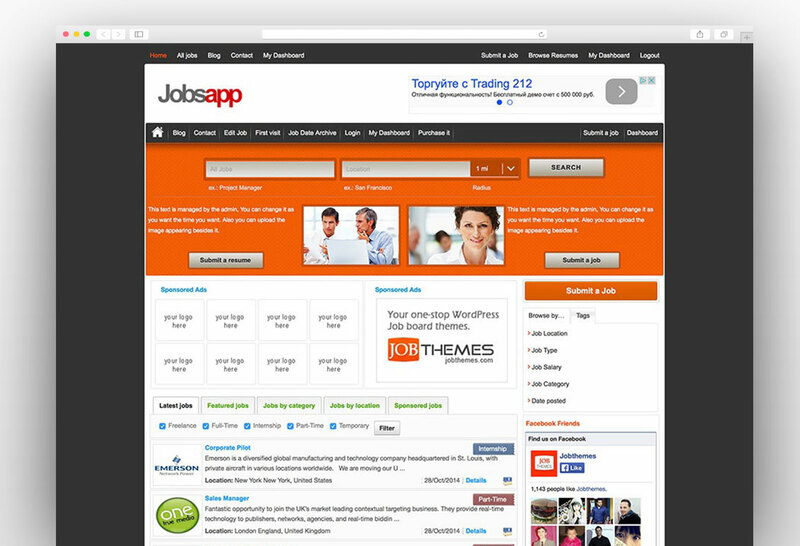 The theme supports WP Job Manager which will turn your website into a powerful job portal. Parents can easily post their job offer using frontend submission form and they can add, manage and categorize job listings using the familiar and friendly interface. And those who are looking for a job can directly contact the job poster via email or the contact form on the website. Similarly, the babysitters or the job seekers can create their profile with their background, basic information, photos, and experience. These profiles can be searched and viewed by the parents and the employers and they can contact the job seekers in a similar way. 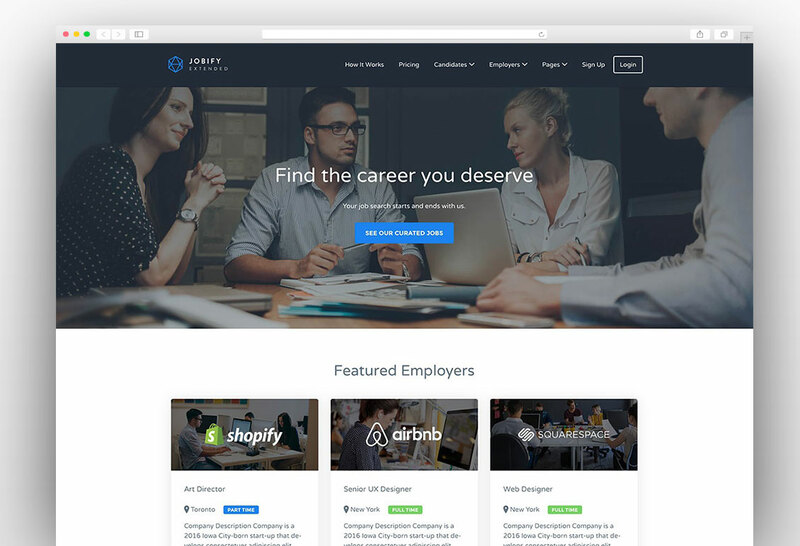 There are five homepage layouts available for this theme and new grid or list view function has been added to the theme for job listings. Other features include powerful admin panel, responsive design, translation ready, font awesome, map integration, translation ready, boxed and full-width layouts, Google fonts and demo content installation. 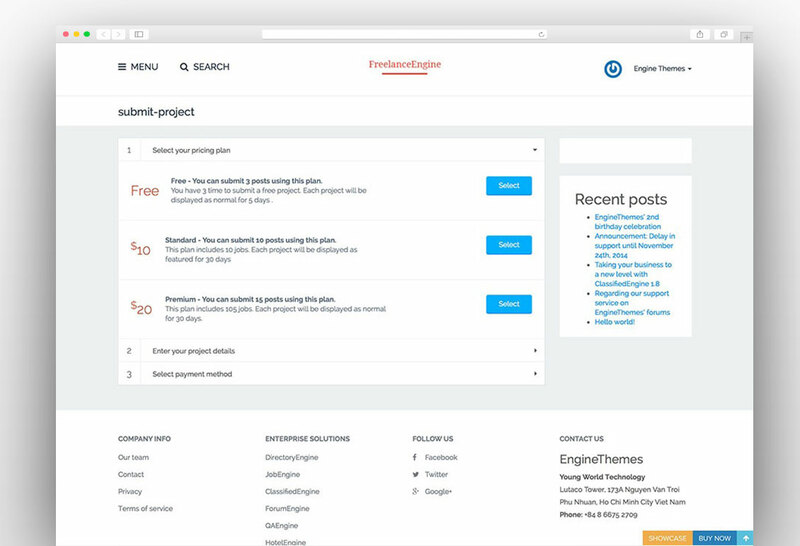 FreelanceEngine is powerful WordPress theme to create a fully functional project bidding marketplace. You can turn your website into a powerful income earning tool by creating paid packages for the freelancers and charging a certain percentage of freelance income. Also, you can charge the job posters for posting the project. You don’t need to worry about all these as this theme has all the features of like paid packages, featured project posts and escrow system. The theme has an easy system for project posting, bidding and transaction system with a reliable escrow system. Everyone will be secure in terms of money due to the secure escrow system. The theme is highly customizable and you can customize it without even coding knowledge. The intuitive interface and drag and drop builder will allow you to carry out customizations effortlessly. The theme is fully responsive and it looks equally good on all screen sizes. The mobile view the theme is stunning and users can use it like they use the other mobile apps as it is highly user-friendly. The theme has been integrated with multiple payment gateways like PayPal, Stripe, and 2CheckOut. The dashboard provides full statistics about the projects, earnings, and registers. 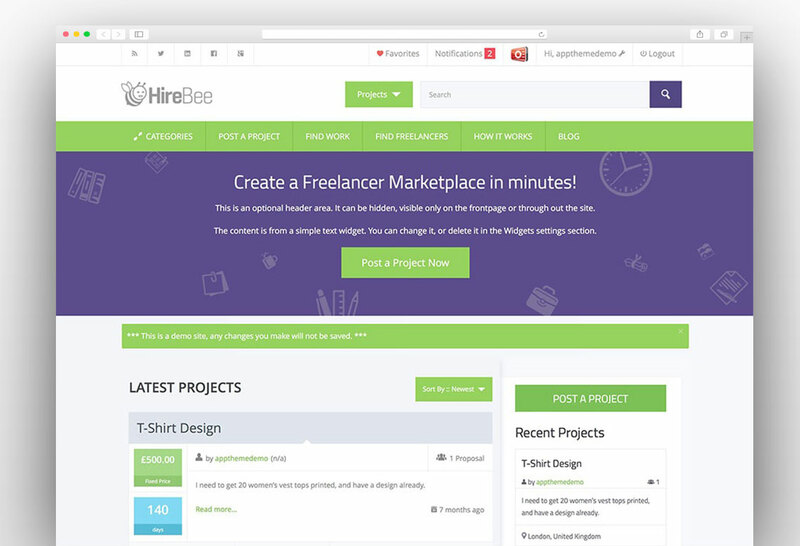 HireBee is a freelance marketplace theme for WordPress where Employers post projects and freelancers start the bidding. You can provide a powerful outsourcing and freelancing platform by using this powerful WordPress theme. There is a huge earning potential as you setup the pricing plans and take a cut of each project. You can also sell the paid memberships for freelancers and employers and offer them different benefits. It’s easy to monetize any niche by providing crowdsourced project matchmaking service. You can create packages by adding various features as more bid limit for the freelancers and featured projects on home page or category page for the employers. The theme is Escrow ready which means you can hold the money until the work is completed. You can set a commission percentage and the worker will be paid after automatic deduction from the payment made by the employer. All the tasks are automated and you can concentrate on marketing efforts to bring more people on the website. The theme has a clean and responsive design with friendly user interface. The rich admin panel dashboard will enable you to manage and customize various aspects of the website. The theme is SEO friendly theme with a dedicated blog section on it. JobRoller is an easy to use and powerful Job board WordPress theme with a large number of unique features. You can turn your job board website into an earning machine by selling the job listing space and receiving new resumes in a matter of minutes. The theme includes both job seeker and employer portals. The employers can manage their job listings from a dashboard, receive an application from the candidates and shortlist them. Similarly, job seekers have their own dashboard for creating profile, resumes and manage the job application they have sent to different job listings. There are custom job types like full time, part time, internship or freelance. There is a custom data base of resumes and job seekers can list their resume in this section. This section is shown on the frontend of the website. Similarly, employers can browse this CV data base and search the most suitable candidate for their job vacancy. As a website administrator, you can manage all the sales and transactions from your dashboard and you don’t need to go to your PayPal account to check the transaction details. There are simple registration and application forms for both the employers and the job seekers. The theme is SEO Friendly. Job Board WordPress theme will allow you to create your own job listing portal in minutes. You can easily get started with the theme as you can install the demo data by just one-click and your website will look like the demo website. The theme is specially designed for the purpose of job listing and it is reflected from the homepage as all important elements like job listings, call to action like post your resume and job search bar are present on the homepage. One will quickly recognize that he is visiting a job portal website. The theme is fully responsive and it looks amazing on all screen sizes and mobile phones. The extensive search widgets provide searchers advanced filters like job function, area, distance and much more. Also, the filter in job listing section provides a handy tool to job seekers and they can filter jobs by different variables. Job Board comes with several payment options including Paypal, Authorize.net, Worldpay, 2CO (2Checkout), Pre Bank Transfer and Cash on Delivery which makes it a powerful tool for the monetization of your job portal website. You can create custom packages for the job seekers and the employers and earn huge money from your website. 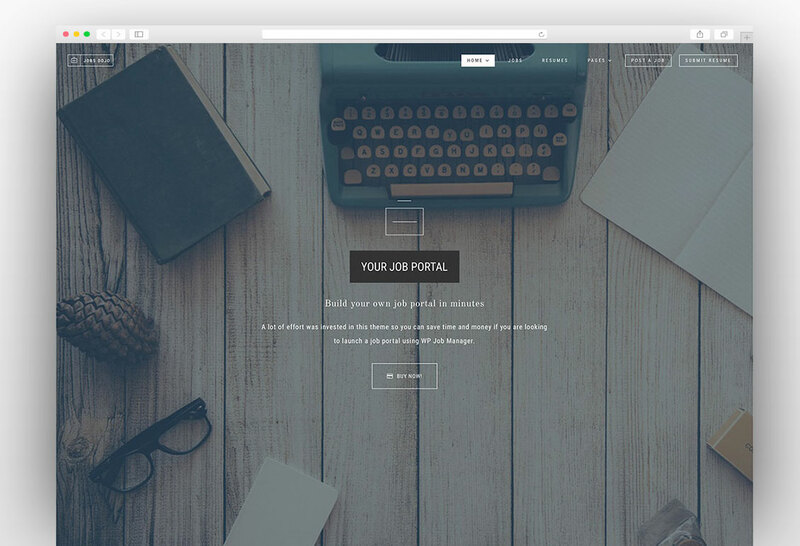 Jobsapp is fully responsive job board WordPress theme which comes with crafty design and features that will make your job board or blog truly stand out. It is specially designed for the HR professionals, Agencies, companies, bloggers and niches’ hunters that they are looking to market themselves and rise above the competition. Jobsapp is fully responsive and all elements on the website including the slider are responsive and they look awesome on the mobile. There are multiple predefined skins and color schemes and you can get started even with any customization required. Theme options panel provides you the advanced styling customization options and you can create endless possibilities by changing navigation styles, backgrounds for each section with colors, images or patterns. Google fonts in the theme will allow you to further enhance the look of your website by choosing an amazing font family. The full-width layout is also included in the theme and you can choose a website without any sidebars or boxes. The theme is also powered with an advertising module which will give an additional option to monetize your website other than the paid memberships and listings. The theme is compatible with all the browsers available there in the market.